I’ve been a lazy blogger over the last come of months, but I find all of my own excuses completely satisfactory. From here, I plan to get back on the ‘ol blogging saddle and perhaps even finish that Voyager mission series. Since Today marks the exact half way point of 2012, it seemed like a good day to start writing again.The reason today is the half-year point is because 2012 is a leap year, but even more, yesterday we had a leap second. Little teaks that keep our clocks and calendars making sense. My relocation has been (and continues to be) from Boston to a small town in Central MA, which just happens to be the same town as my special observing site. It also gets me closer to the more recent astronomy club I’ve joined and since been almost totally absent, since it was so damn far away. This should make observing more regular and interesting. I think observing will actually be pretty OK from our new backyard as well, which could be very convenient. Since I’ve been not blogging, the Venus transit happened and while we were clouded out in Boston, the internet allowed me to see it in a number of wavelengths and from several locations. Here’s my favorite pic from the event, which was snapped by a Japanese satellite. I’m not surprised some people thought this was fake. 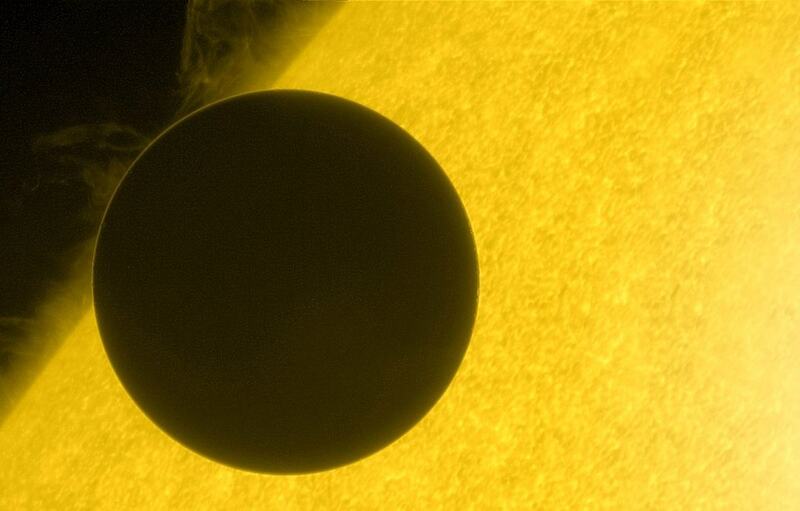 You can see sun shining through the atmosphere of another planet, which is astounding. I also managed to completely miss NEAF this year due to our move and the planning (not to mention money) it required. My wife tells me we’re definitely going next year, which I’m not about to argue. She’s a good wife. So, expect some new posts which will definitely be rich in bad puns and worse jokes, but will probably have some content relevant to astronomy.